City Blinds has been established for nearly 20 years and we have grown into the company we are today by offering a fantastic quality and range of products and the highest level of service at all times. 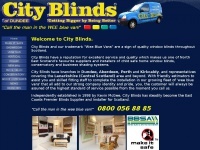 A profile of City-blinds.co.uk was found on the social network Facebook. The web server used by City-blinds.co.uk is located in Germany and run by 1&1 Internet AG. There are many websites run by this web server. The operator uses this server for many hosting clients. In total there are at least 143 websites on this server. The language of these websites is mostly english. The websites of City-blinds.co.uk are hosted by a Apache server and were developed in the programming language PHP. The content management system WordPress in the version 4.8.7 is used. The HTML pages were created with the latest standard HTML 5. The website does not specify details about the inclusion of its content in search engines. For this reason the content will be included by search engines.